We carry an extensive line of alumina abrasives in a wide range of abrasive sizes and are available as powders, slurries, suspensions and colloids. They are available in various package sizes and are used in many applications and industries. From the lapping of semiconductor materials and precision glass optics, to the polishing of metallographic specimens. Provided in AG (As Grown) and DA (De-Agglomerated) formats. High purity and uniform particle shape ensures consistency from lot to lot to deliver the best possible quality finish regardless of application. Applications: lapping and polishing of Ceramics, glass, precision optics, Quartz, Sapphire, Silicon, Germanium, Gallium Arsenide, Cadmium Telluride, Piezo Electric crystals and metallographic specimen preparation. PremaLox Aluminum Oxide Powder is a high purity fused Aluminum Oxide. It undergoes stringent grading and inspection techniques to assure uniform size and quality of particles, which in turn prevents random scratching or damage to the work piece. 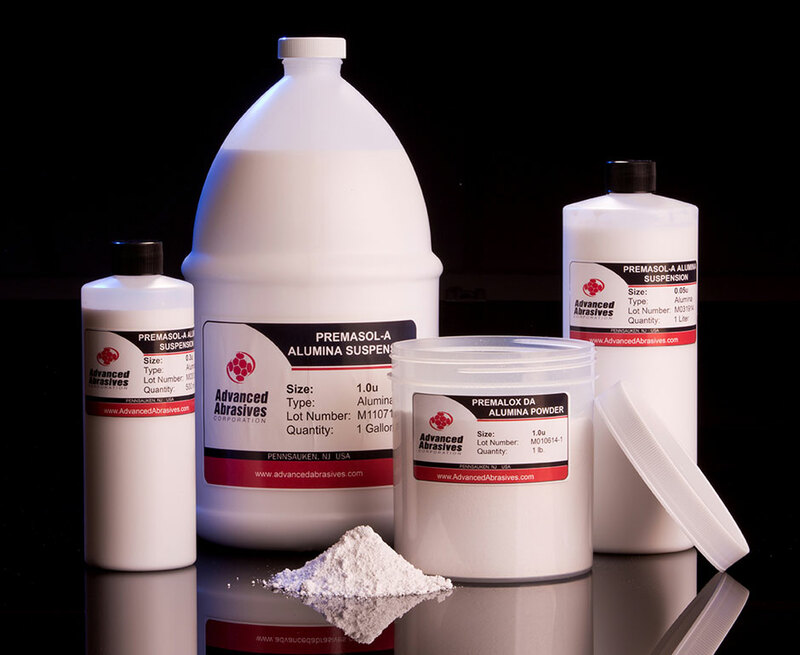 PremaLox AW is formulated to disperse in a water based medium and is available in a number of particles sizes ranging from 0.5um up to 80 grit. Applications include: lapping and polishing of glass, precision optics, Quartz, Sapphire, Gallium Arsenide, Cadmium Telluride, Piezo electric crystals, grinding wheels, bonded and coated abrasives, plasma coatings, specialized blasting (wet or dry) and compounds. Produced using our 99.99% purity de-agglomerated alumina powder in a proprietary carrier to create a permanent suspension. These formulas are an easy and clean alternative to powders and are the best way to a perfect finish. Available in abrasive particle sizes 0.05µm, 0.3µm, and 1.0µm and in quantity sizes of 1 liter, 1 gallon and 5 gallon containers. Applications: Lapping and polishing of Ceramics, glass, precision optics, Quartz, Sapphire, Silicon, Germanium, Gallium Arsenide, Cadmium Zinc Telluride, Piezo Electric crystals and metallographic specimen preparation. Produced using our PremaLox Aluminum Oxide (Al2O3) powder in a proprietary carrier to create a permanent suspension. Available in abrasive particle sizes 0.5µm to 80grit and in quantity sizes of 1 liter, 1 gallon and 5 gallon containers. Applications: Grinding, lapping, polishing of Ceramics, glass, precision optics, Quartz, Sapphire, Silicon, Germanium, Gallium Arsenide, Cadmium Zinc Telluride, Piezo Electric crystals and metallographic specimen preparation. High purity alumina particles held in an acidic (pH3.5) colloidal suspension. This is an easy flow formula that can be diluted with DI-Water up to a 3:1 ratio. Available in quantity sizes of 1 liter, 1 gallon and 5 gallon containers. Applications: Final polish of ferrous metallographic specimens and ceramics.